I am back from my walk, and took this pretty picture of oak leaves to share with you. Anyone else see a quilt there? I know I do! So, let’s move to the next step, shall we? I will trace the pattern on to the backing fabric. I have used white; you could use any light colured fabric, perhaps a blue or a green? The pins are in place to mark the top and bottom edges of the feather and the centre. 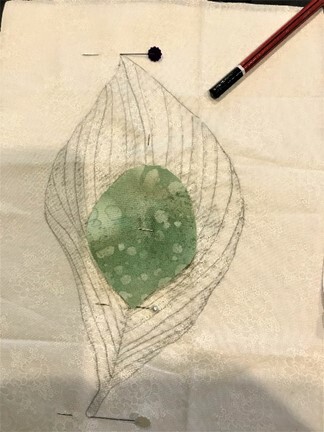 I placed the white fabric on the paper print-out of the peacock feather outline and traced it using an ordinary HB lead pencil! I would recommend you use a washable marker if you have access to one. Remember the tracing is to be made on the right side of the backing. I had a glass table to work on so it was easy to see through the white fabric. You could tape the paper pattern on a glass window and the background fabric on top of that. When I was tracing from the pattern, I realized that the centre was not marked very clearly on the pattern. Now, what? 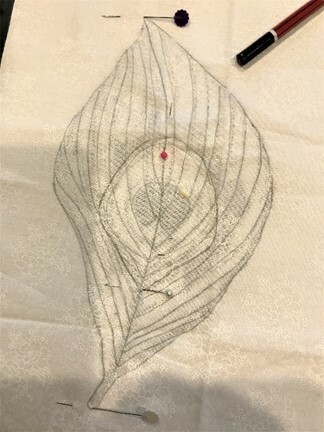 I placed the fabric centre of the feather, wrong side up on the tracing and drew the outline on the backing. I placed the green centre ( wrong side up) on the centre of the backing fabric and traced around it to get the centre edges. Now my backing is ready. I remove the paper from below, but I leave the pins in place to mark the top and bottom of the feather and the centre on the backing. These are important. 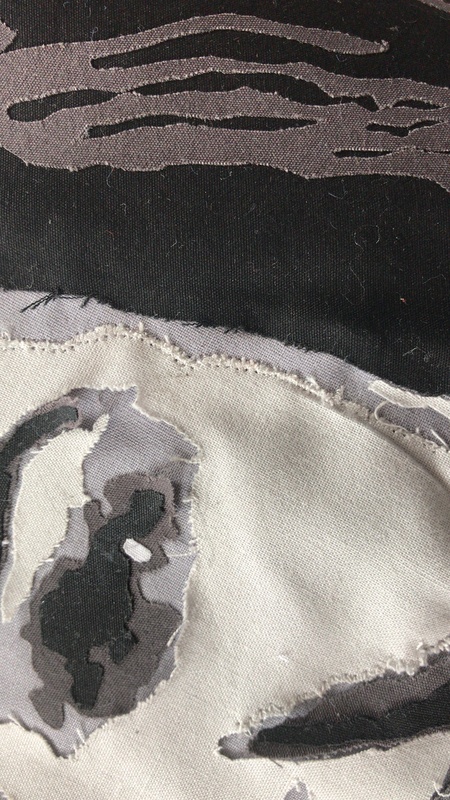 Layer 1–the black background fabric for the feather on the bottom, placed wrong side up. Layer 3–the backing right side up (with the tracing on top). Now I carefully pin the three layers together, in exactly the same place as on the backing. This gives me the edges of my feather, and helps me in the placement of the blue-green fabric that will form the main body of my feather. The sandwich from the front. Where is the centre of the feather, you ask? For that you will have to wait–till I am ready to start quilting. Meanwhile, I am waiting for you to share your chosen fabrics on Facebook! Happy cutting, tracing and pinning! 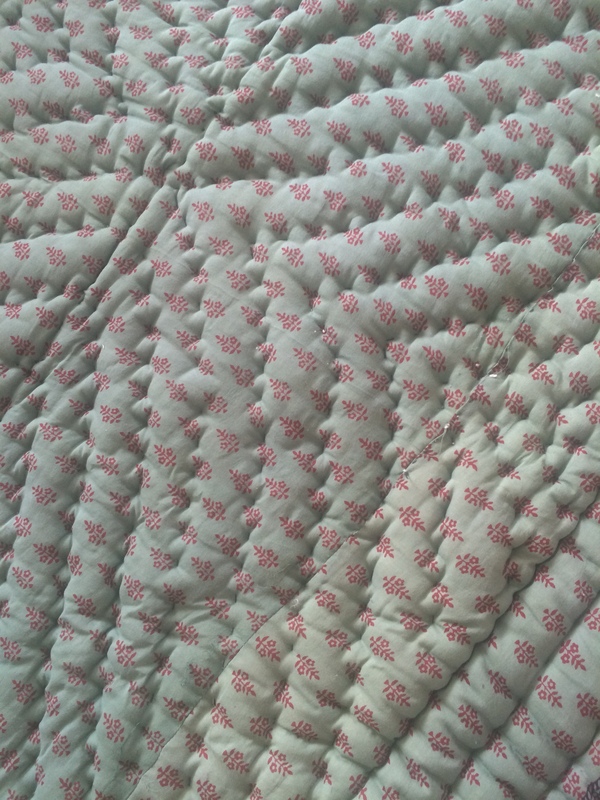 For a list of materials required and the PDF pattern for the 7″ quilted feather, refer to the first post about this quilt along. 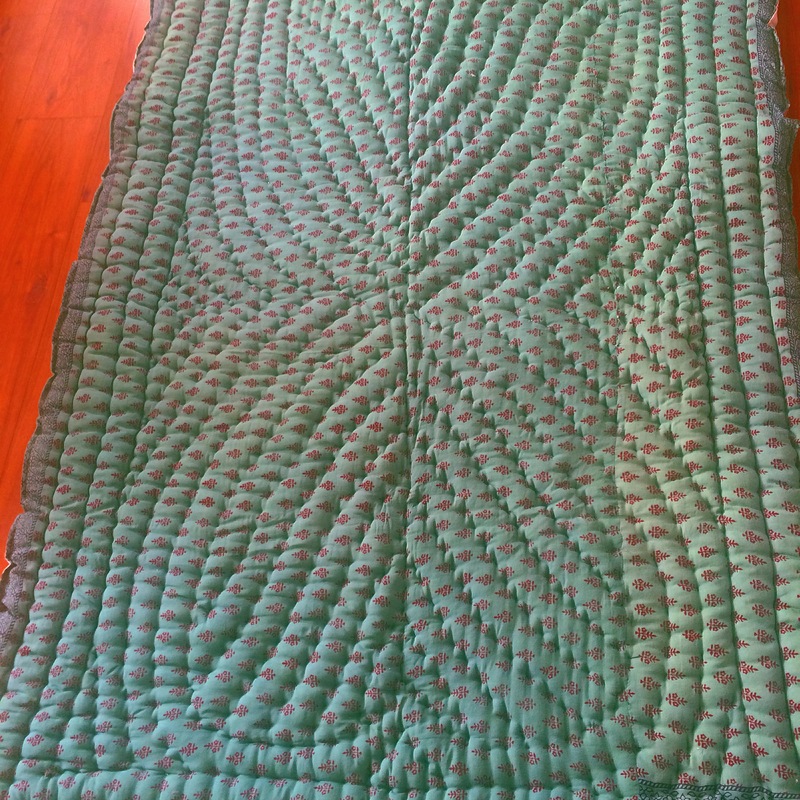 For the cutting instructions for the feather, refer to the second post about this quilt along. You can also download a PDF file containing cutting instructions from that post. If you want a print-out of the tracing instructions given above, download the PDF file given below here. 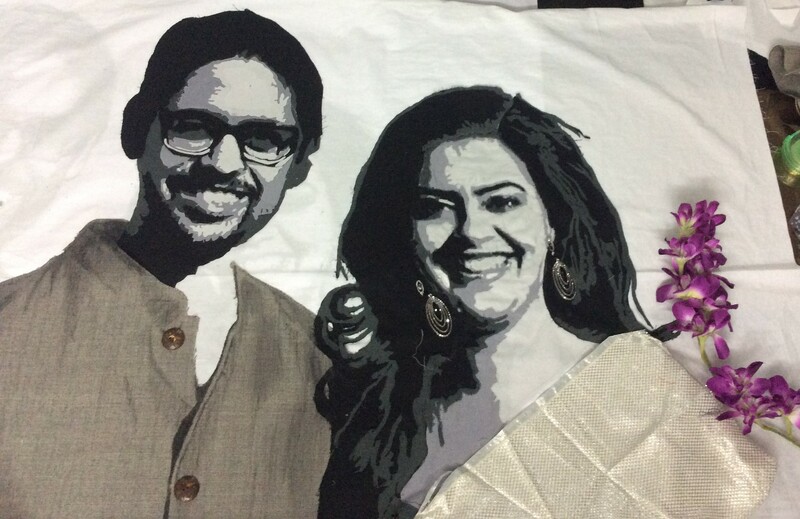 I have been feeling so bad that I will not be able to attend the first ever India Quilt Festival in January 2019, at Chennai. So many of our Indian quilters, and a few international ones too, have sent in their quilts; there are nearly three hundred entries! But so many of us couldn’t; we didn’t have the time, or perhaps we didn’t feel confident enough. 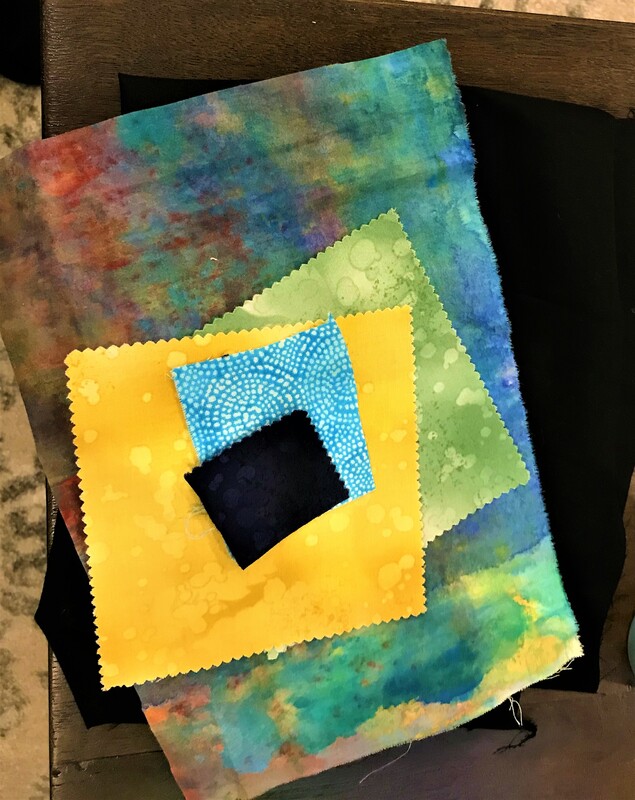 And being there…seeing all those beautiful quilts, meeting and learning from some of the best quilter-teachers in the world! Wow, that would be a dream come true for so many of us. Would we not love to participate in some way, however small? 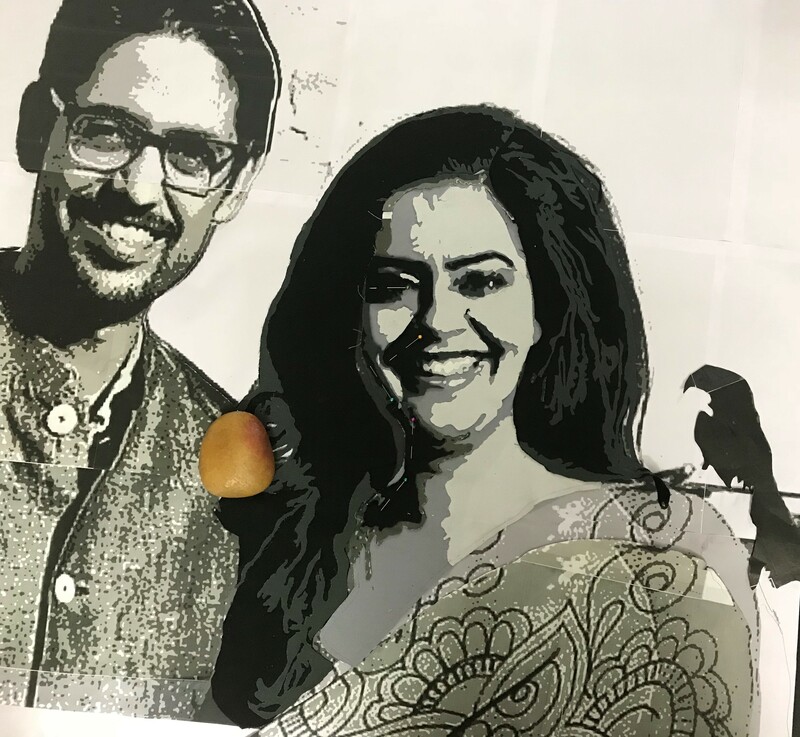 So when Tina Katwal, the heart and brain behind the show, asked me if I would like to do something for the festival–so that all of us sitting at home could be part of the show–I said yes immediately. 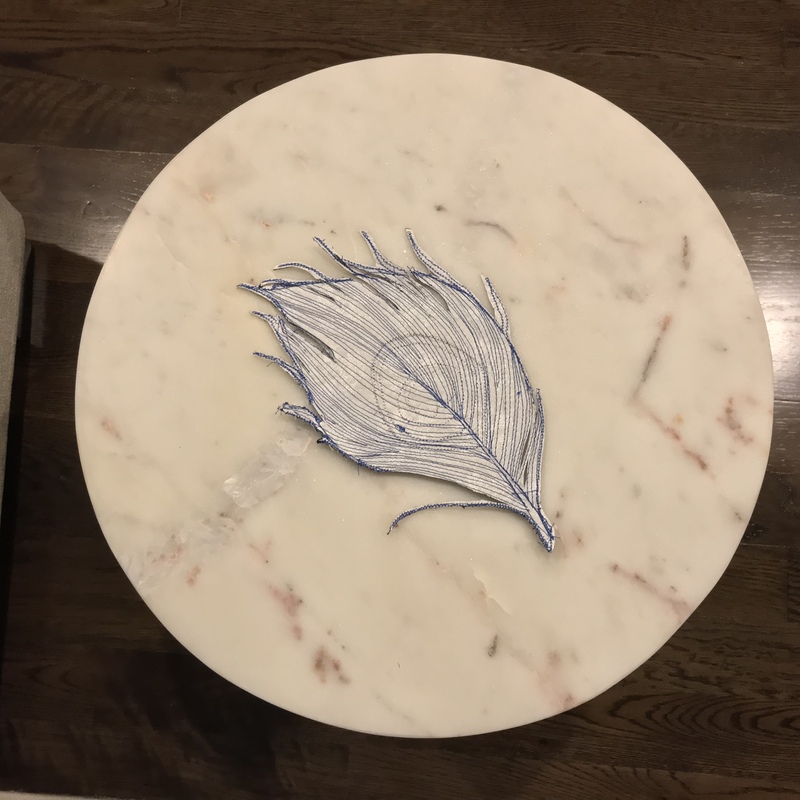 She had something in mind (let that be a secret for now) but for that I needed to design a peacock feather, easy enough for even a beginner quilter to put together with fabric scraps. 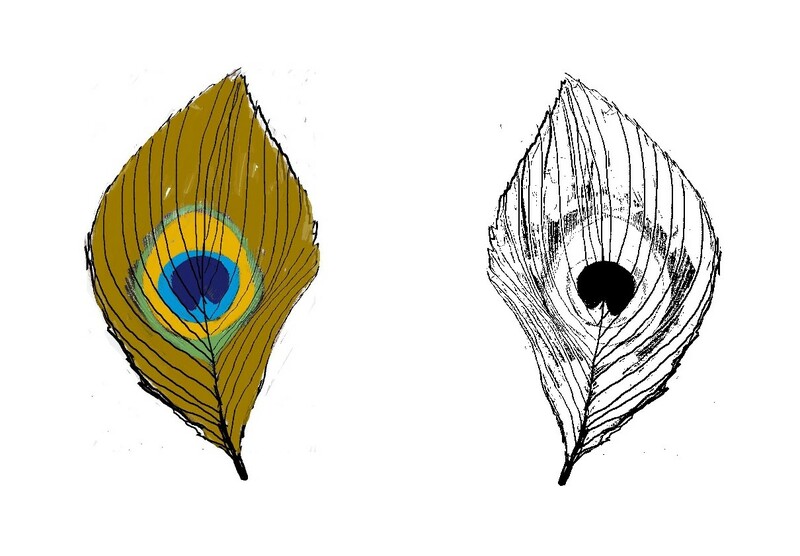 We would be making our very own peacock feathers, using my pattern, and sending them to Chennai for Tina’s secret project…Sounded like an exciting idea! 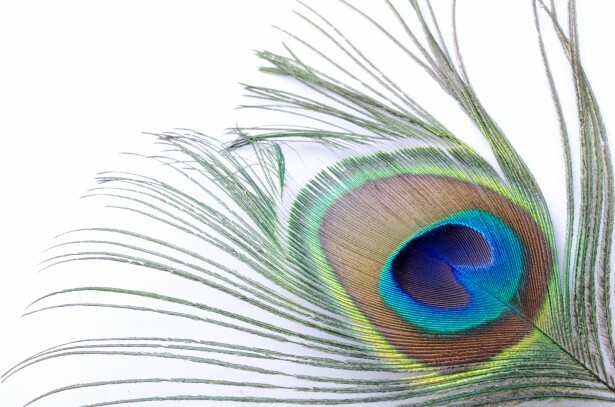 For those of you who do not know, India’s national bird, the peacock, is the theme of the festival and one of the themes for the judged quilt show too! 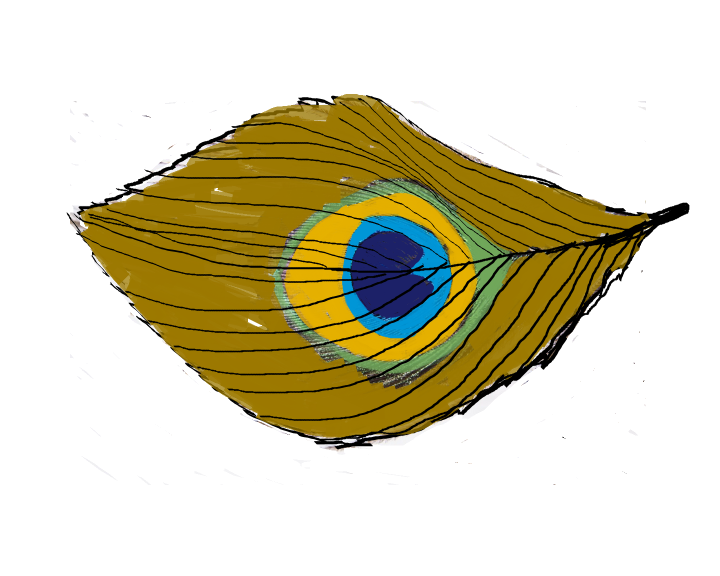 I designed the feather on the Bamboo Paper App on my iPad—that was in September, just before I left to visit my son. I decided last week, finally, to start working on the feather, but…I have no quilting supplies here! Thankfully, I did carry with me the fabric that I would be using for the feather. And, I have converted the sketch to a PDF file. So let us see how we can convert this to a quilted object. 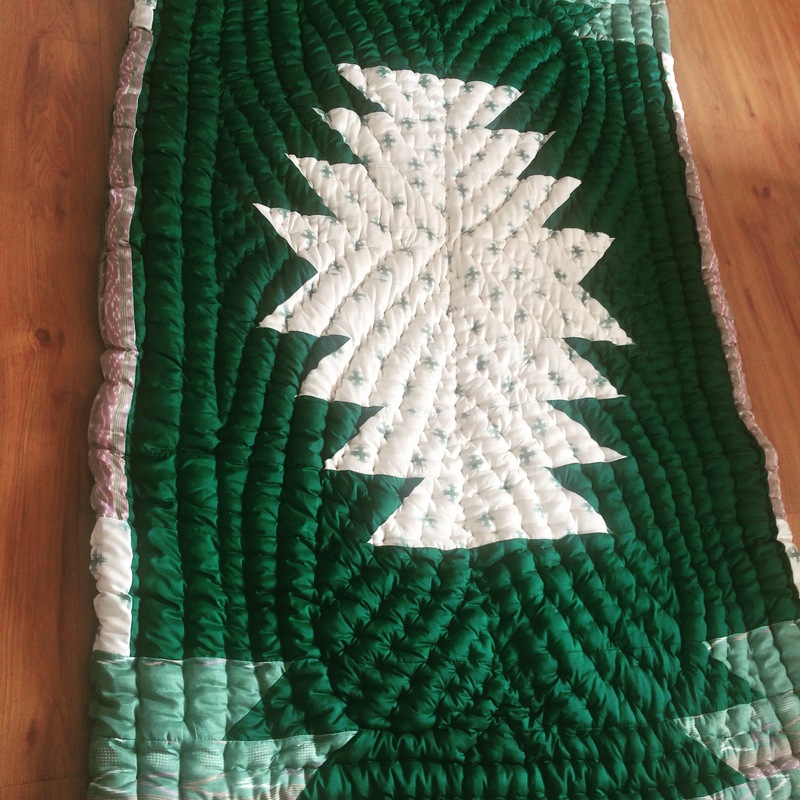 I thought a quilt along would be a good idea so that we could help each other if we got stuck. Today, we get our fabric together and print out the pattern. The fabric requirements are for a 7″ feather. I plan to add patterns for a larger 10.5″ and smaller 6″ feather, if this works out okay. Batting: 8” x 10” piece. You could possibly use any thick fabric or a piece of flannel instead. That should help in making the feather stiff (and will be easy to work on even if you don’t have a walking foot for your sewing machine.) I do not have any of these, so my feather will be not be a true sandwich. Machine Sewing Thread: Black/ blue/ green/ mustard to contrast with your background fabric. I am using a royal blue thread because…you guessed right…that is the only thread I have here! Here is a picture of my fabrics! Aren’t they delicious? These beautiful fabrics are gifts from my quilter friends! 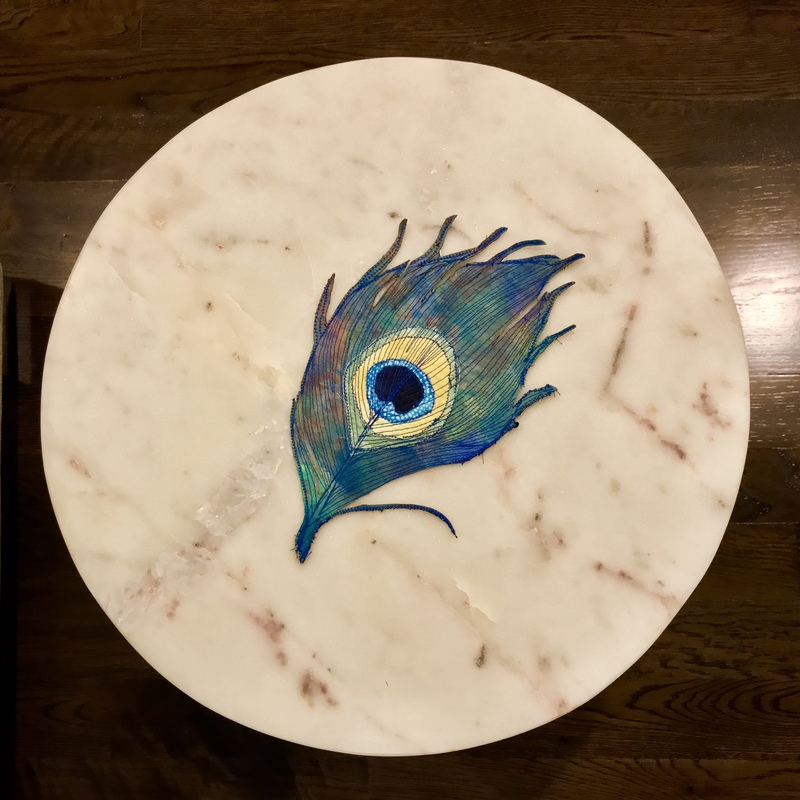 The feather fabric is hand-dyed by and a gift from Sobana Sundar, our very own Desi Quilter. The green, yellow and dark blue are Fossil Fern by Benartex, a gift from another DQ, Chumkie Mukherjee! The other thing I am going to do today, is print out the pattern. I have my pattern printed. You can see that the pattern is in two pages and that the outline is a mirror image of the coloured feather. The pattern for the feather is in two pages. Print both! Now that this is done, I am going to take a well-deserved break ( it is past midnight here!) and will be back tomorrow to work on it! Meanwhile, why don’t you share on the IQF Facebook page what fabrics you have chosen for your feather? Given below is the PDF pattern for the middle-sized 7″ peacock feather that I made. If you want a print-out of the materials required, download the second file also. You will need Adobe Reader on your computer to be able to read this. It can be downloaded for free online! 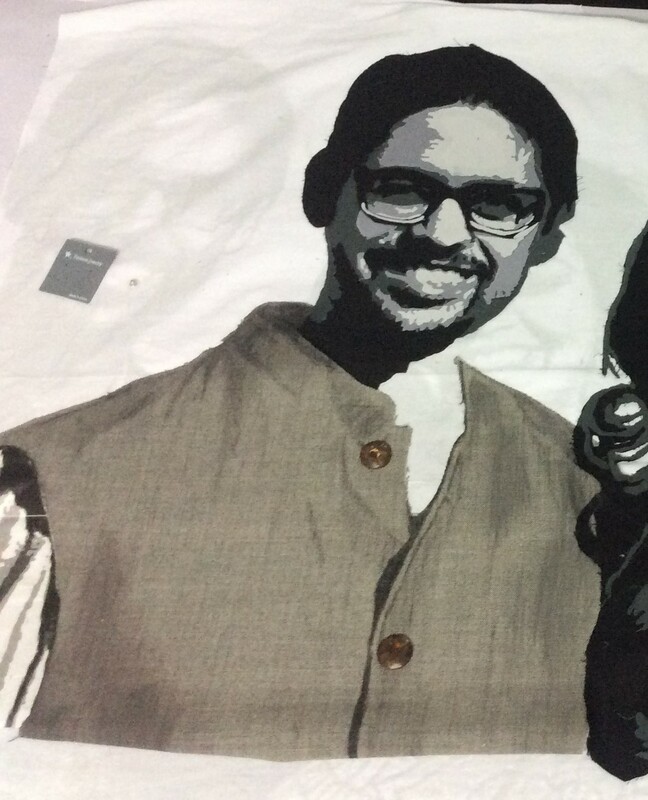 Portrait of a Girl…and Her Man! 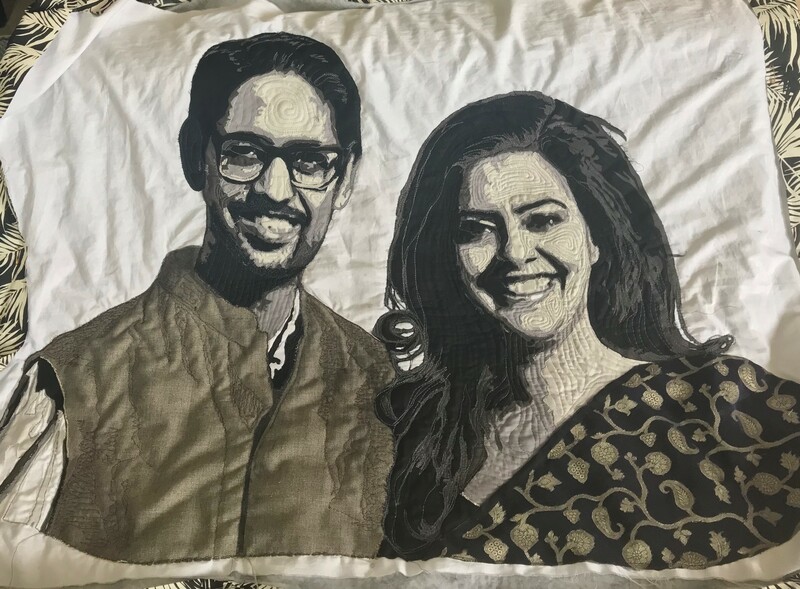 I wanted to make something special for my son and daughter-in-law for their fifth wedding anniversary and thought this would make a great gift. 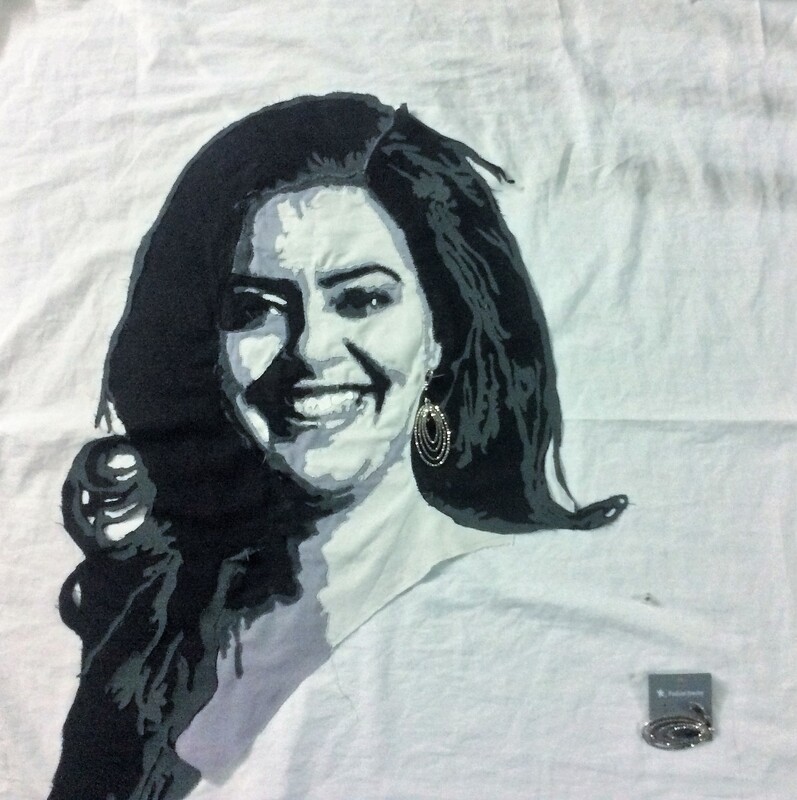 Many of you have asked me how I put together the portrait, so I will try to do a brief summary here. 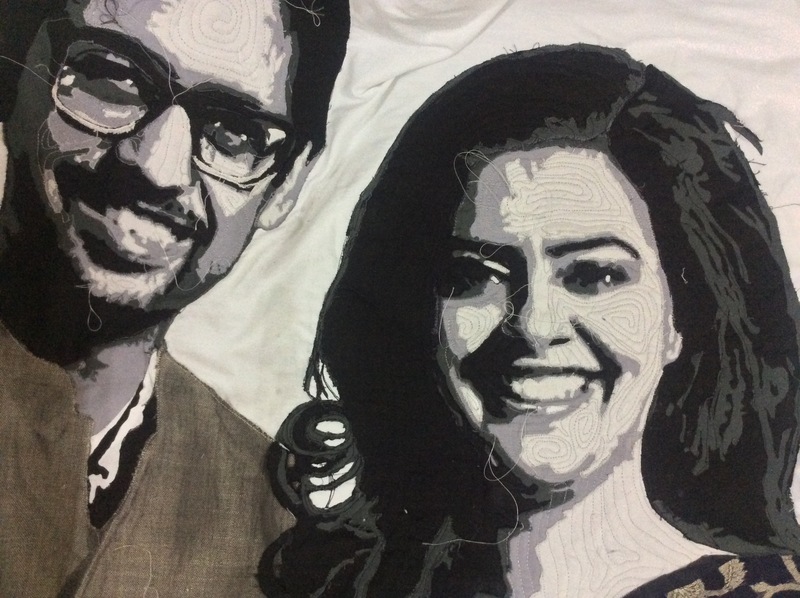 But before I do that, I must record my thanks to a generous friend and wonderful artist, Manju Narain, who is a master of portrait quilts and who worked as my guide and sounding board as I created this portrait. The choice of picture is important. Take a high resoltion picture so that you do not lose out on the details. Mentally remove any extraneous elements in the background as you weigh the pros and cons of a particular picture. Does the picture speak to you, tell you something about the person behind the face? I went through several photos, changing them to black and white, checking for contrast and drama before I zeroed in to this one. My daughter-in-law, M’s, smile is a blinder and (of course!) I think, my son has a very sweet smile too. Once the picture was finalized, I reduced the number of colours to five- black, white and three greys . I don’t have Photoshop and was not satisfied with the result obtained with Paint, so I searched online and found a great site which works beautifully well. I enlarged the picture to 30″ x 40″; then took two full size prints-out, one on plain paper and the other on freezer paper and pulled out black, white and grey solids to work with. 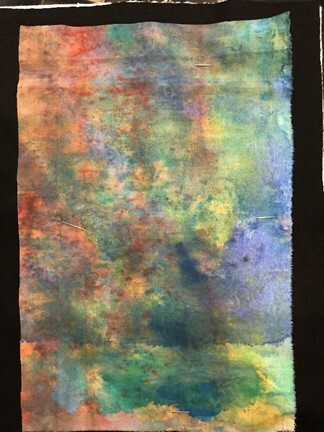 I trimmed away the background from the freezer paper print. The plain paper picture would work as a guide. I also kept a print-out of the original picture in colour, for reference. 4. I traced the outer outline of the figures and the garments on the white background fabric- this will help me in the final placement of the figures on it. No pictures of this! 5. 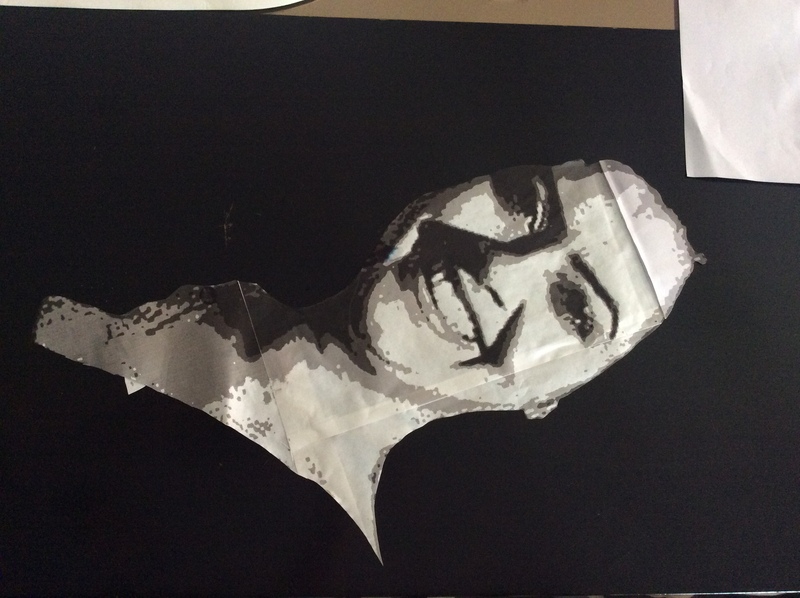 I began work on my DIL’s (daughter-in-law’s) face and neck first. I built the portrait in layers, like one does with oil paints. 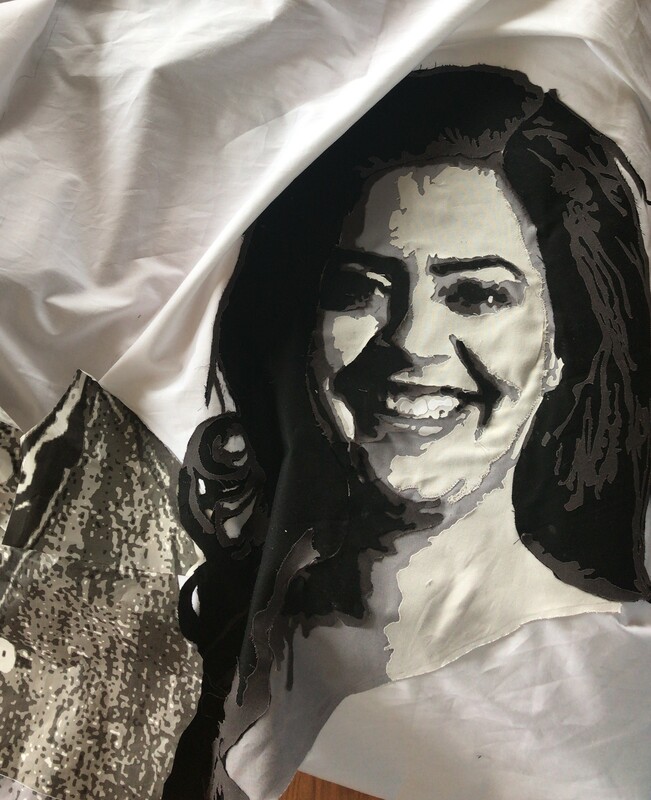 I decide to use the medium grey fabric as a base for the face on which the features will be built up. I ironed the freezer paper on the right side of the fabric which will form the lowermost layer. I built up the various layers, using the freezer paper templates as guides. For the really tiny pieces, I ironed a two-sided fusible on the wrong side of the fabric before cutting out the pieces. 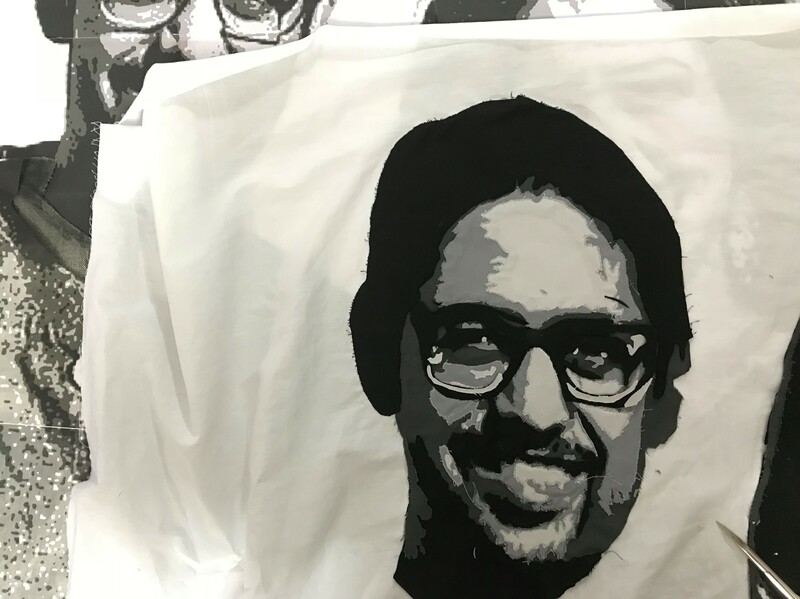 They could then be ironed in place. (The details, such as the white highlights on the nose, teeth and eyes would come in last after most of the quilting had been done). 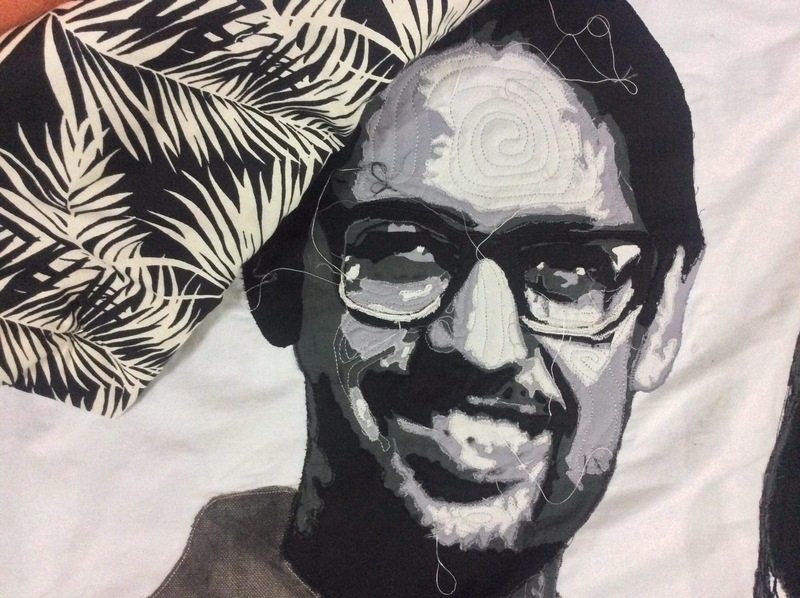 Auditioning the fabric face on the plain paper print out. Now I was ready to create Son’s face. Here, the base would be the dark grey. 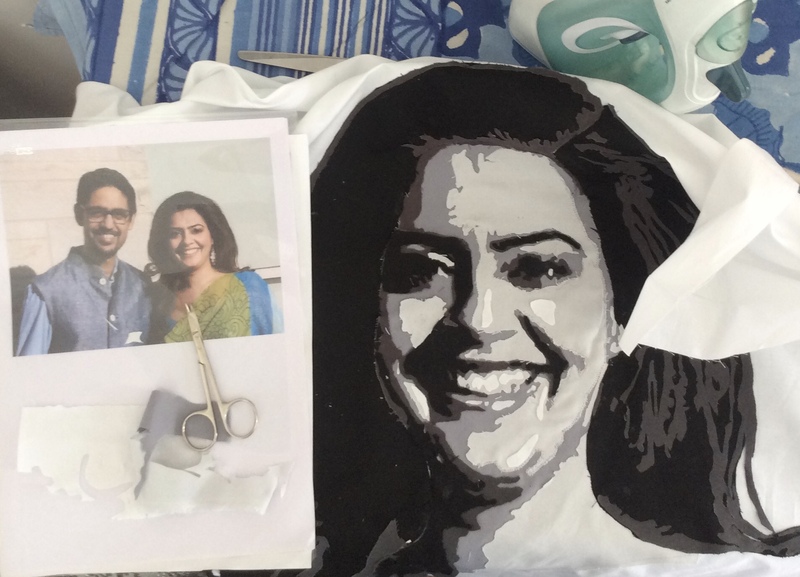 The basic shapes finished, I stitched DIL’s face in place on the background, using my pencil tracing as a guide. I referred to the coloured picture to get the highlights and shadows on the picture right. The great thing about having freezer paper templates is that you can iron them on the background fabric to make sure you are stitching pieces in the right place! The deadline for finishing the quilt approached, but we had guests over whom I had to take shopping! That is where I found the perfect danglers for DIL! Son’s jacket was a bigger problem. He is wearing a light blue jacket in the photo and I wanted to use their garments to add colour and zing to the portrait. Instead, I found this brown furnishing fabric-the texture seemed perfect! I also found the perfect buttons in my mother-in-law’s collection; they came from a coat that belonged to my father-in-law almost half a century ago. The jacket is furnishing fabric! The buttons are from his grandfather’s coat. Now I was thinking about DIL’s saree. Also, I needed colour here! That is when I remembered how fond DIL was of orchids and had insisted on purple orchids for her jaimala (garlands exchanged by bride and groom) on her wedding. So we went orchid-hunting! I finally managed to find these silk orchids, so pretty, don’t you think? White silk and purple orchids for DIL? 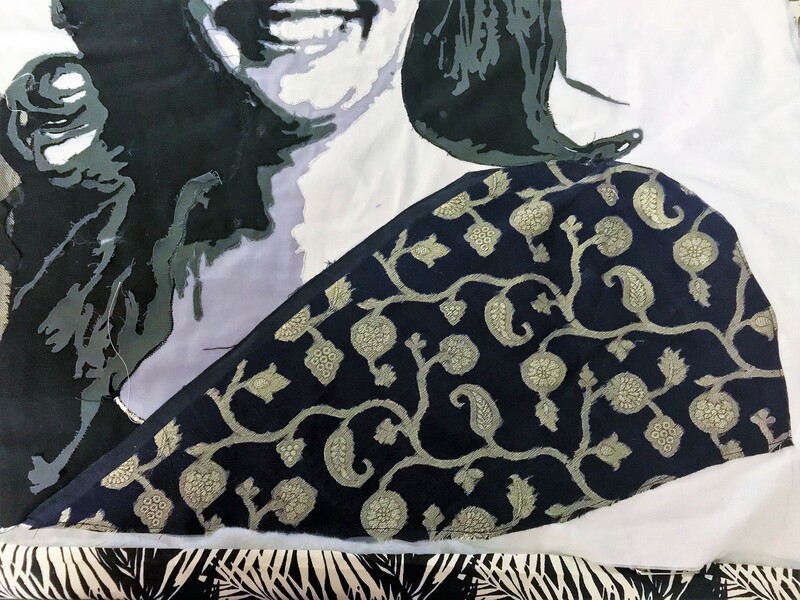 …and find the loveliest black tissue brocade in my stash for DIL’s saree. I auditioned gold tissue for her blouse, but settled on black. This is looking good now! Love the way it is coming up! Oh God! What have I done to it? Should I rip it out? But, what the heck! Let us jump right in! My only hope is that quilting the background will improve it! Well, lots of more quilting-and here we are. 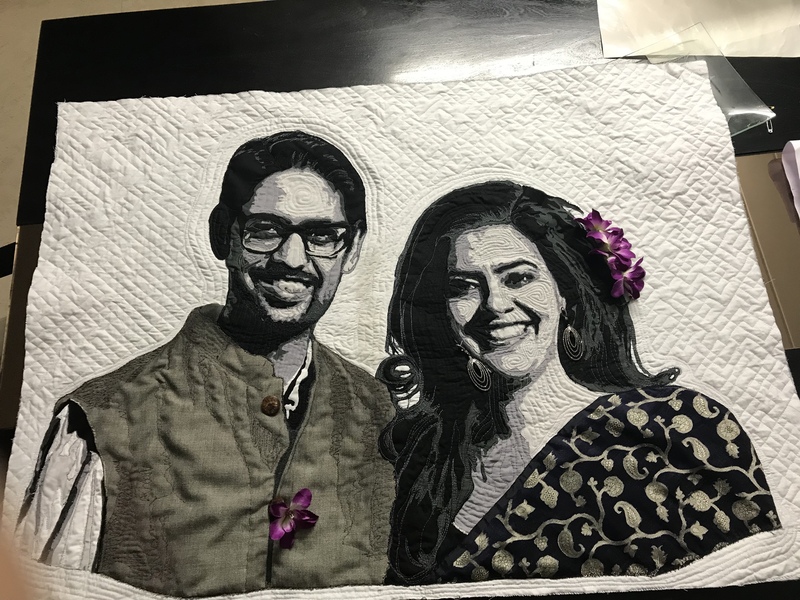 I finally decided to add five orchids to the quilt, four in DIL’s hair and one in Son’s buttonhole for it was five years of married life they would be celebrating! 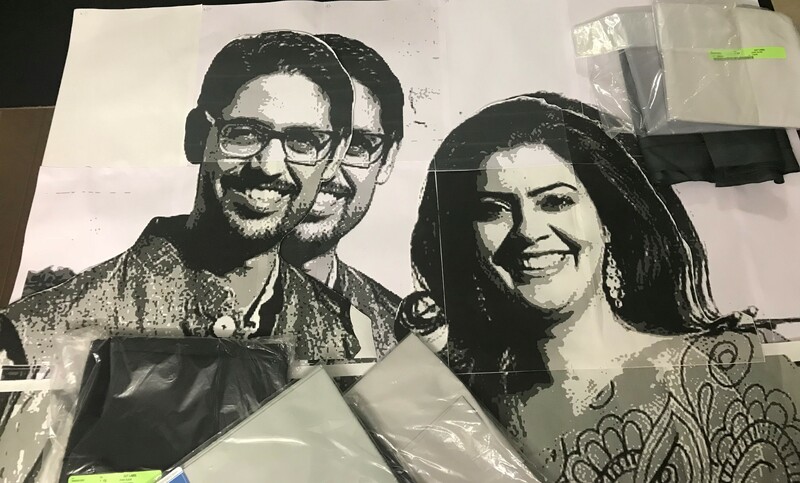 The binding was done, dots of white Inktense pencil inks added to the teeth and noses, hanging sleeve attached and I was ready to share the pictures of their gift with the children on their wedding anniversary. I brought it with me when I travelled to the US to visit them. 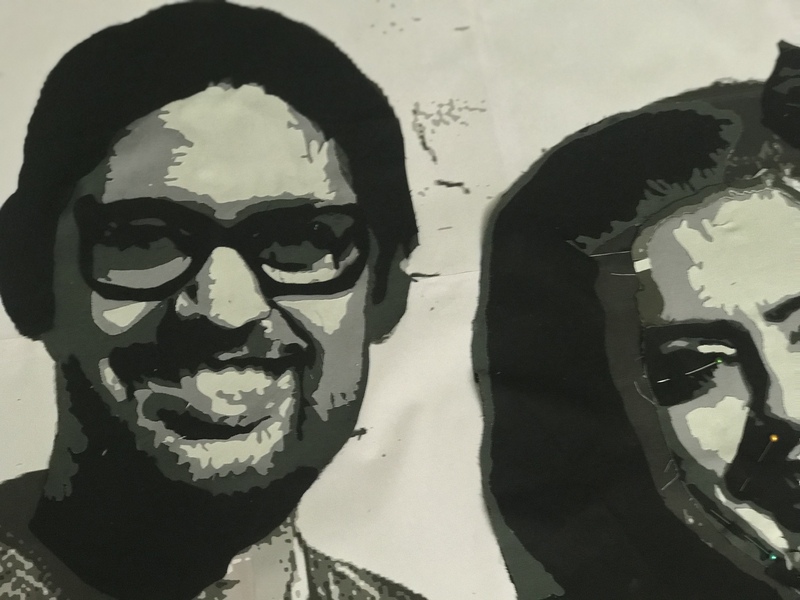 Here is the portrait on their dining room wall. Incidentally I used the ‘Hang-it-Dang-it’ hanger to hang it and it worked wonderfully well! A final close look at the portrait before I say goodnight! 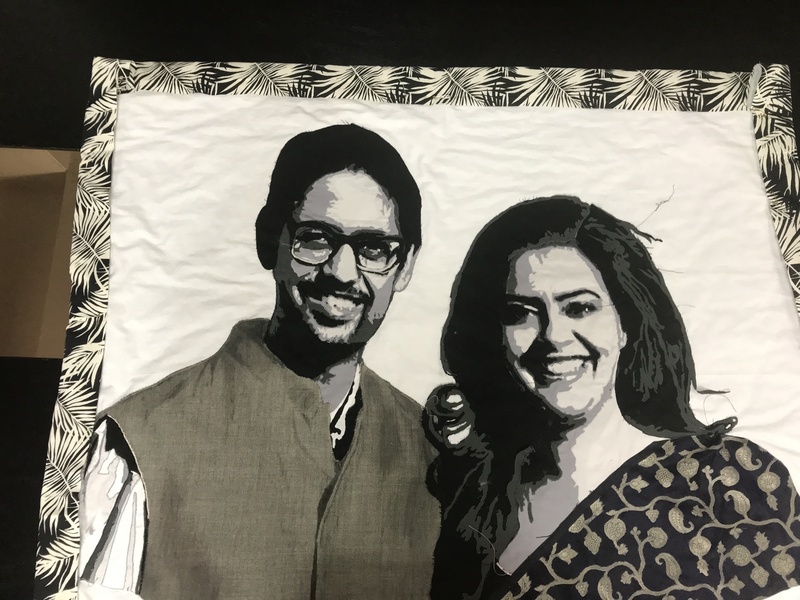 Author MadsPosted on December 29, 2018 December 29, 2018 Categories My Quilts, Patchwork of my lifeTags art quilt, black and white portraits, freezer paper in portrait quilts, Portrait Quilt, tips for making portrait quiltsLeave a comment on Portrait of a Girl…and Her Man!